To defeat Trump and address the systemic crises of our time, progressives need to confront one of his most effective strategies: harnessing the power of narrative. Get a copy of “Re:Imaging Change” when you sign up to be a WNV member, starting at $5/month. As we hit the one year anniversary of the 2016 elections, many of us are still recovering from residual feelings of shock, despair and terror — while ramping up the resistance with increasing momentum. Politics in the United States has always been a rigged game — legalized bribery, voter suppression, racist fear-mongering, sexist norms. But Trump has taken it to a whole new level, at least in our lifetimes. Like it or not, we are in a dangerous political moment of “alternative facts” and alternate realities. As is typical, the progressive response to the right’s deceitful antics has been to focus on fact-checking, while continuing to allow the right to define the framing of the dominant narrative. Obviously, the facts matter. But we will never fact check our way to power. If we want to defeat Trump and build momentum to address the systemic crises of our time, progressives need to confront one of Trump’s most effective strategies: harnessing the power of narrative. But what does that mean, and how do we do it? For the past 15 years we have been helping organizers, communities and grassroots movements contest dominant narratives and “change the story” in order to build power and advance progressive campaigns. We are co-founders of the Center for Story-based Strategy, which supports movements and trains organizers to develop creative, narrative strategies. 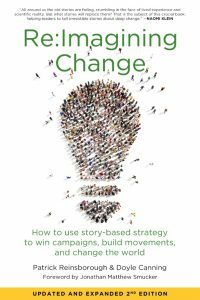 The recently released second edition of our book — “Re:Imagining Change: How to Use Story-based Strategy to Win Campaigns, Build Movements and Change the World” — provides theoretical frameworks and hands-on guidance to challenge oppressive narratives and amplify progressive campaigns. The updated version features inspiring examples from a wide range of issues, campaigns and movements, including Black Lives Matter, environmental justice, immigrant rights, anti-war, climate justice and the Trump resistance. Despite the dire circumstances of 2017, these times are abundant with possibility. The flood of resistance, the outpouring of solidarity and the increasing popularity of anti-capitalist alternatives points to a rising left in the United States. The Trump resistance can evolve into the progressive renaissance we so desperately need, if we can have the courage and clarity to articulate and organize around a different narrative. A first step is to embrace the power of narrative to build power and create change. The following excerpt comes from the chapter on “Narrative Power” and offers frameworks to understand how narrative operates as a critical component of all power relationships. We live in a world shaped by stories. They come in all shapes and sizes: mundane anecdotes, Hollywood blockbusters, prepackaged “news” stories, cherished childhood memories, religious stories conveying ancient lessons. A story can unite or divide people, obscure issues or spotlight new perspectives. A story can inform or deceive, enlighten or entertain, even do all of the above. Stories are the threads of our lives and the fabric of human cultures. But how does narrative power actually work? We absorb stories from many sources: family, personal experience, the media, and religious, cultural and educational institutions. Some stories we learn consciously while others are just part of the cultural background. These stories teach us how society functions, and create a sense of shared culture and identity. The most powerful of these stories operate as contemporary mythologies. Lesson one in narrative power: Myth is meaning. Don’t be limited by the common pejorative use of “myth” to mean “lie,” and miss the deeper relevance of mythology as a framework for shared meaning. Myths are often mistakenly dismissed as folktales from long ago describing fantastical realities, but even today a sea of stories tell us who we are, what to believe and towards what we should aspire. These stories play the same role that myths always have: answering fundamental questions of identity, origin and worldview. Today we may be less likely to believe that the Sun is pulled across the sky by a God in a chariot, but many people are perfectly willing to believe a specific personal care product will make us more beautiful, or accept the claims that their country is “exceptional,” superior or even specially favored by God. As the narrative animal, we use story to structure the patterns we observe around us. Take the example of the night sky. 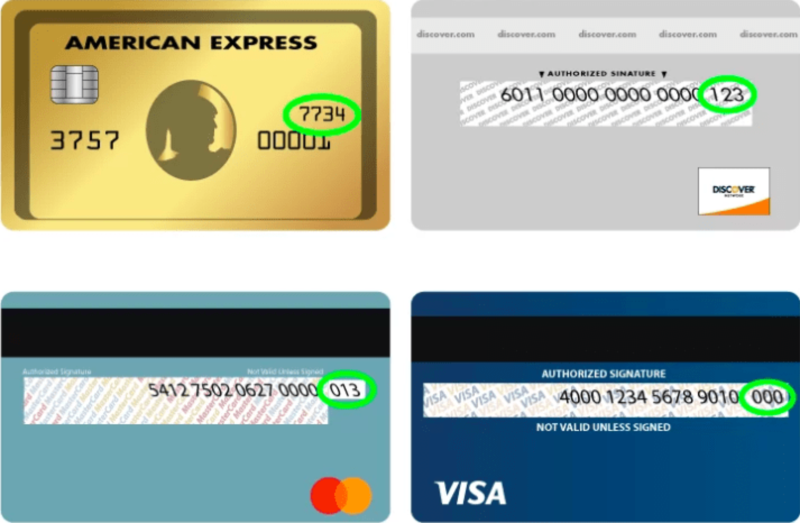 In the illustration above you see an image that you probably recognize. Were you taught a name for this grouping of stars? 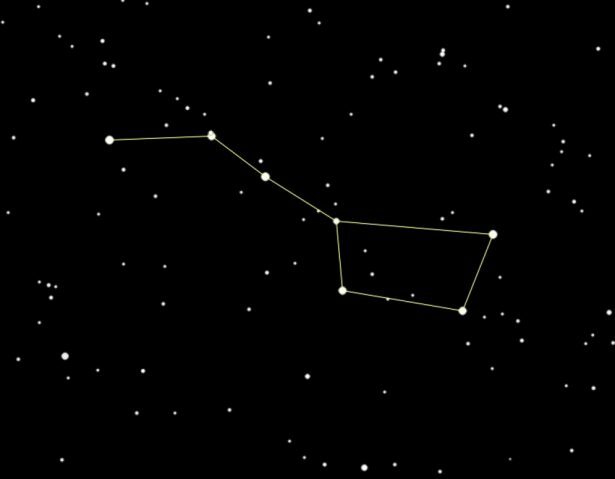 Different cultures have given it different names: the Plough, the Wagon, the Great Bear, the Saucepan and frequently, different versions of the Big Dipper. But is there really a giant saucepan in the sky? Of course not (at least we don’t think so), but that’s not the point. The stories used to map constellations helped our ancestors make sense of the night sky and pass down practical skills like finding the North Star to navigate at night. Different cultures connect the dots to see the shapes associated with their own stories, but across the world, people looked to the sky and created myths that gave them meaning. The Big Dipper is a simple example, but it shows us a critical aspect of narrative power: the difference between truth and meaning. Meaning doesn’t just exist in the world waiting to be discovered, rather meaning is produced by human interpretation as we translate it into language (what cultural theorists like Stuart Hall call “representation”). The power of the story does not derive from its factual truth but rather from the story’s ability to provide meaning. Narrative is one of the primary ways we humans create meaning in the world. Understanding the complicated relationship between truth and meaning is the foundation of story-based strategy. Too often progressives think that just because a story is factually true, it will be meaningful to our audiences, and therefore, build our power. But the reality is just the opposite: If a story is meaningful to people, they will believe that it is true. The currency of narrative is not truth but rather meaning. In other words, there is no inherent connection between the power of a story and whether or not the content is objectively true. After all, if having the facts on your side was enough to win, we would live in a very different world. Narrative power manifests as a fight over how to make meaning. We often believe in a story not because it is factually true but because it connects with our values, or is relevant to our experiences in a way that is compelling. Having the facts on your side is only the first step towards winning, because the facts alone are not enough to transform understanding and reshape meaning in people’s hearts and minds. Thus people fighting for a better world need to take our truths — about injustice, racism, environmental destruction or whatever issue we are working on — and make them meaningful to the people we are trying to reach. Story-based strategy is not an invitation to ignore or distort the facts but rather a recognition that to be persuasive you need to use the power of story to make the most important facts matter. Since humans understand the world and our role in it through stories, all power relationships have a narrative dimension. Stories are imbued with power. This could be the power to legitimize an unjust status quo or justify acts of coercion and brutality. Likewise, story has the power to make change imaginable and urgent, to convince people to see a better future and believe in their own collective agency. Many of our current social and ecological problems have their roots in the silent consensus of assumptions underlying current political discourse, for example: Humans can dominate and outsmart nature; women are worth less than men; racism and war are part of human nature; white people are better than people of color; and U.S. foreign policy benevolently spreads democracy and liberation around the world. To make real and lasting social change these latent narratives must be surfaced and challenged. A narrative analysis of power encourages us to look at how meaning is operating and ask: Which stories define cultural norms? Where did these stories come from? Whose stories were ignored or erased? What new stories can we tell to more accurately describe the world we see? And, perhaps most urgently, what are the stories that can help move us towards the world we desire? The role of narrative in rendering meaning in our minds is what makes story a powerful force. These power dynamics operate both in terms of our individual identities — whether or not you get to determine your own story — and on the larger cultural level: Which stories are used to make meaning and shape our world? What individuals, groups or nations are portrayed as heroic? And whose story is presented as villainous, weak or just irrelevant? These questions are the narrative dimensions of the physical relationships of power and privilege, the unequal access to resources and denials of self-determination that shape contemporary society. Asking these questions can help bring a narrative power analysis into social change campaigns. Doyle Canning is cofounder of the Center for Story-based Strategy. She is dedicated to expanding the political imagination and building powerful, ecological justice movements with strategic nonviolence and story-based strategies. Doyle is a consultant, speaker, trainer, and coach, and is pursuing a JD degree focused on climate change law at the University of Oregon, where she is a fellow at the Wayne Morse Center for Law and Politics. Follow her adventures @doylecanning, and at doylecanning.com. Patrick Reinsborough is a strategist, organizer and creative provocateur with over 25 years of experience in movements for peace, ecological sanity, democracy, indigenous rights, and economic, racial and global justice. 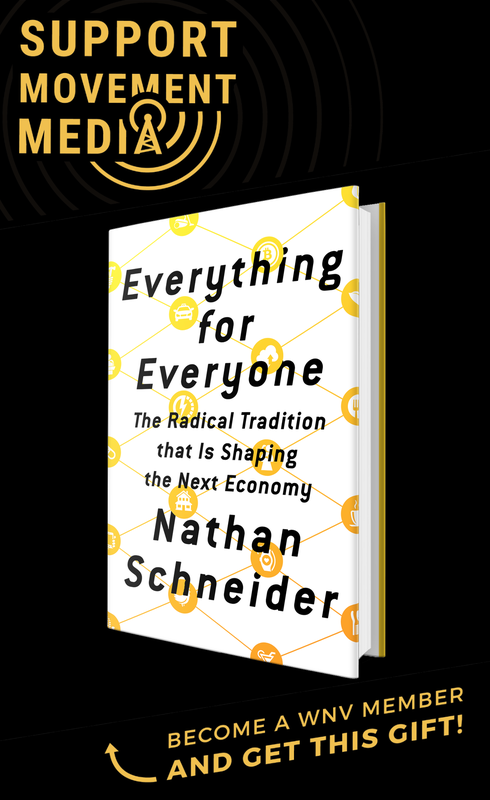 He cofounded the Center for Story-based Strategy (formerly smartMeme) in 2002 to explore the intersection of movement building, the ecological crisis, and strategies to shift cultural narratives. Follow him on Twitter at @RadicalWhispers and find out about his latest projects at www.patrickreinsborough.com. This is a nice promo for your book. But, where is your “meaningful narrative” to counter Trumpism? You didn’t suggest anything about what our narrative should be! That’s a bit unfair Michael. It’s a bit like telling Gene Sharp he didn’t have a plan for a specific uprising. The book details a generic method for individual groups to construct their own narrative, be it against Trump or anyone else.